A severe storm hit the heart of Misty Brook at 6pm on July 28th, 2015. It looked like a thunderstorm, but arrived like a hurricane. When it hit there was no visibility. 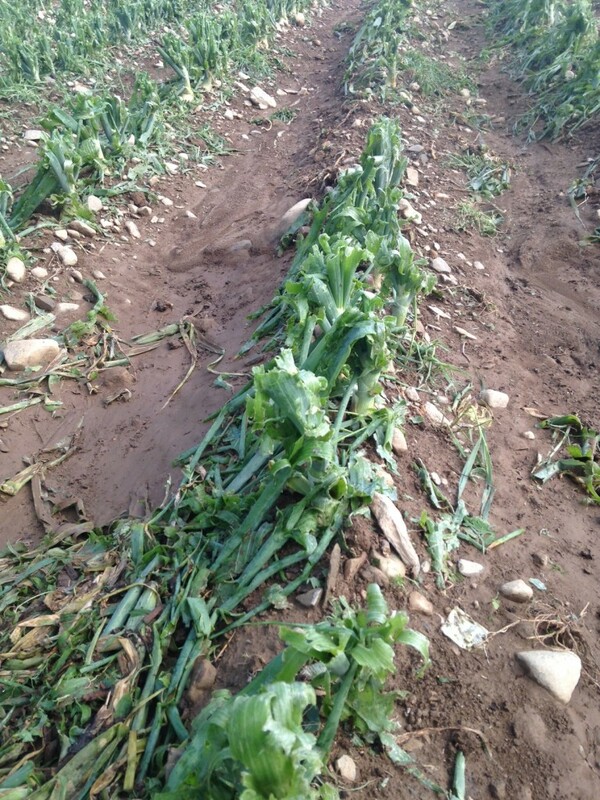 Plum size hale, torrential, rain, and 70 mile per hour winds whipped and pummeled the farm in all directions. This down blast lasted 10 minutes and when it ceased there was mayhem. Our garden soil flowed down the hill as we rounded up all the shell shocked livestock that had run through their fences. With power lined down everywhere, we got the tractor hooked to the generator and milked the cows late. By the time we were done it was dark and the cows spent the night in the barn. The next days were spent surveying our losses with the insurance adjuster, USDA support, and friends. We have tarped roofs, fixed fence, and tried to find a semblance of normal. We are thankful that no humans were hurt. 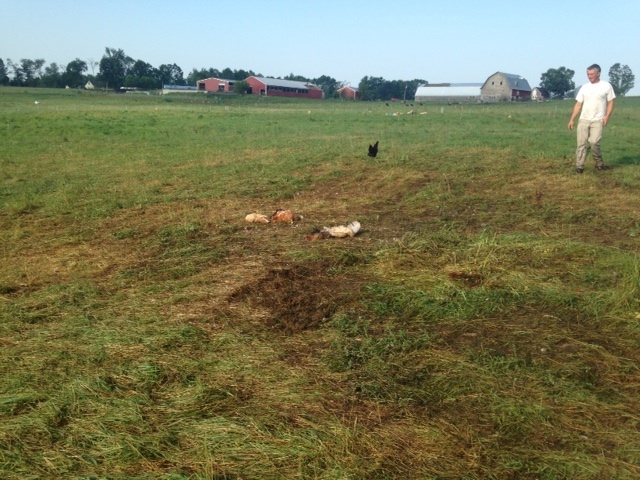 Pasture was ready to graze and will need time to recover, especially clover and alfalfa. 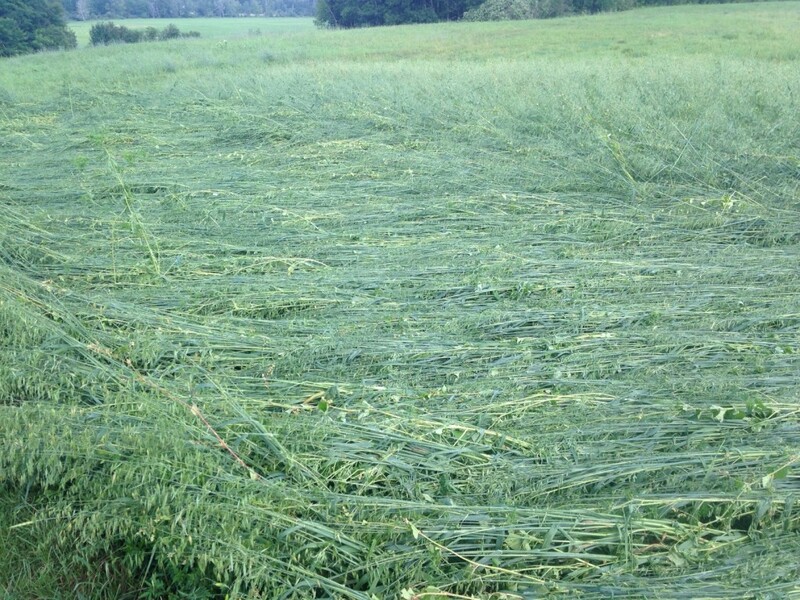 Hay damaged in the barns that lost roofing. 17 Layers found dead, plus lost egg production. No Cows, Pigs, Sheep, or Horses were harmed, but milk production is down due to stress & pasture loss. 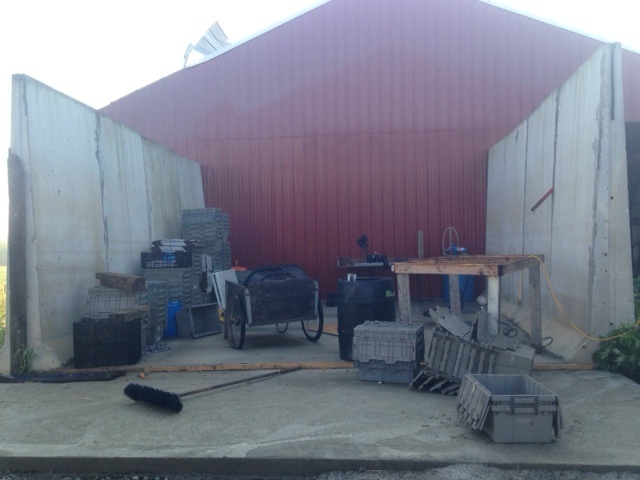 Vegetable Wash Shed – Roof was blown away and the wiring went with it. This building was not insured. 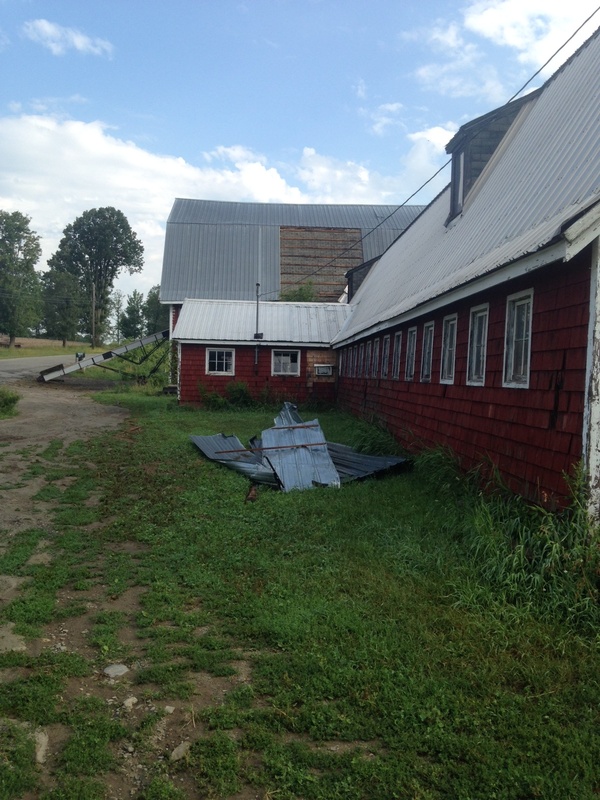 Hay Barn – Roofing was blown all over the farm. Insured with a $5,000 deductible. 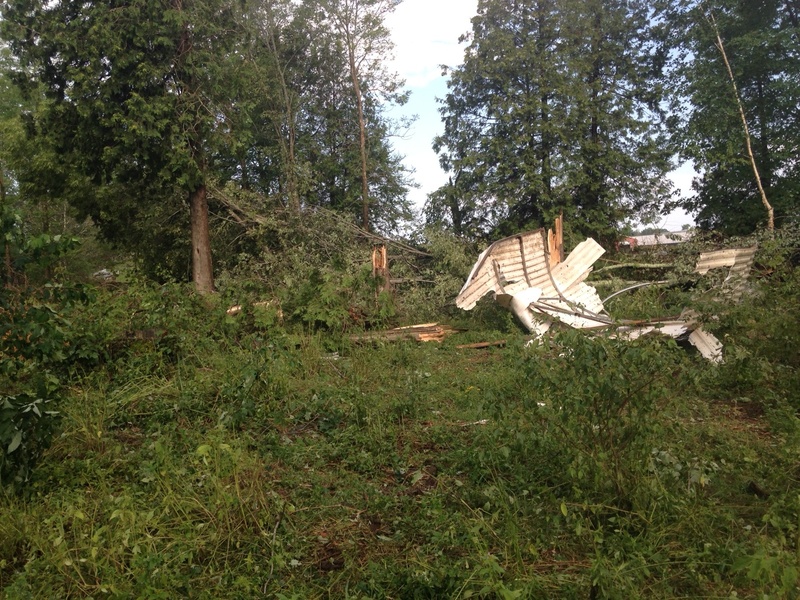 Heifer Barn – Roof was torn open and shredded. Insured with a $2,500 deductible. 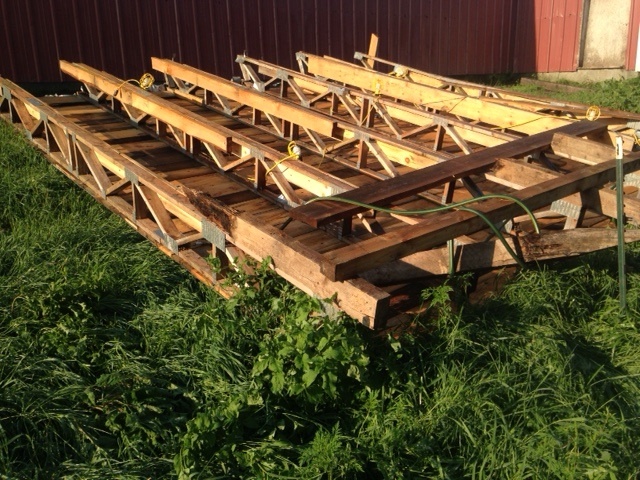 Temporary Shelters – Blown away and smashed. No insurance. Fencing was destroyed by up-rooted trees and will require posts, wire, and labor to repair. 2 chicken range feeders were blown away and smashed $200. Our priorities are to clean up the mess and repair the buildings. 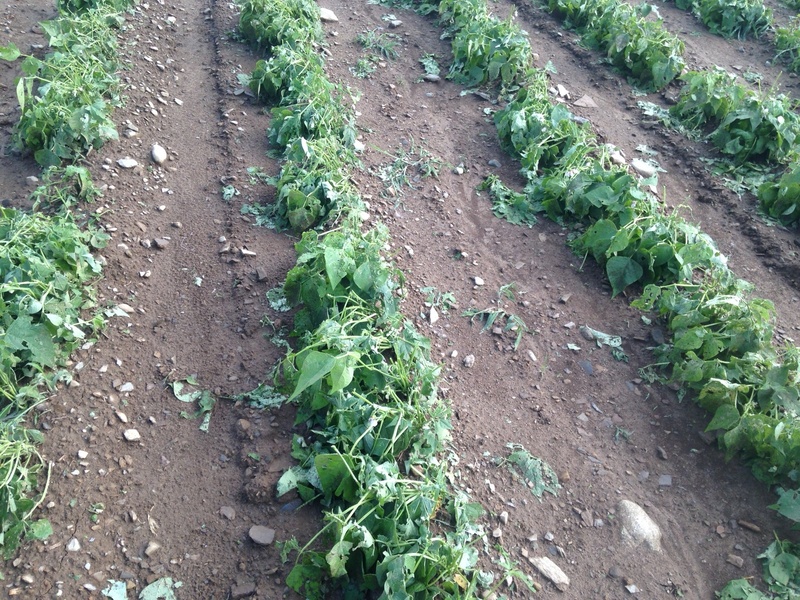 It is too late in the season to replant most of the vegetable and grain crops. 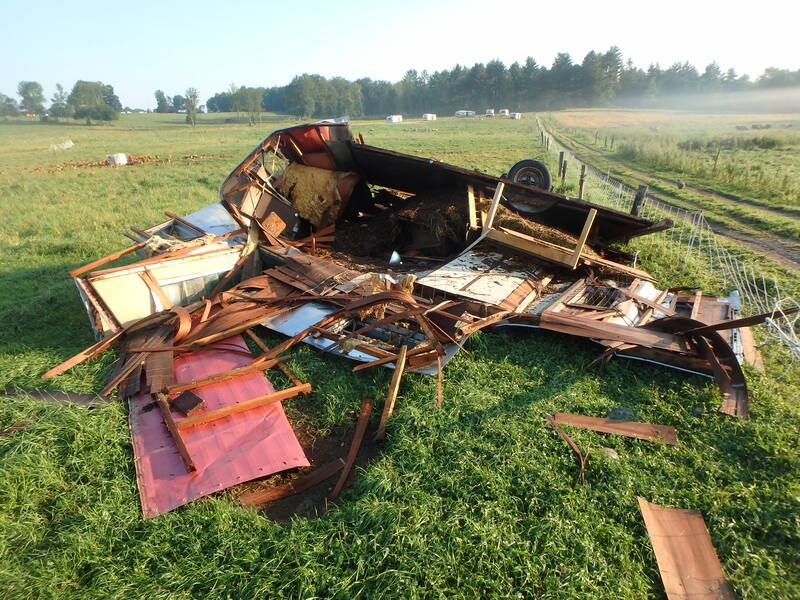 We would love volunteer help to clean up the broiler camper, temporary shelters, and roofing that is strewn across the farm. 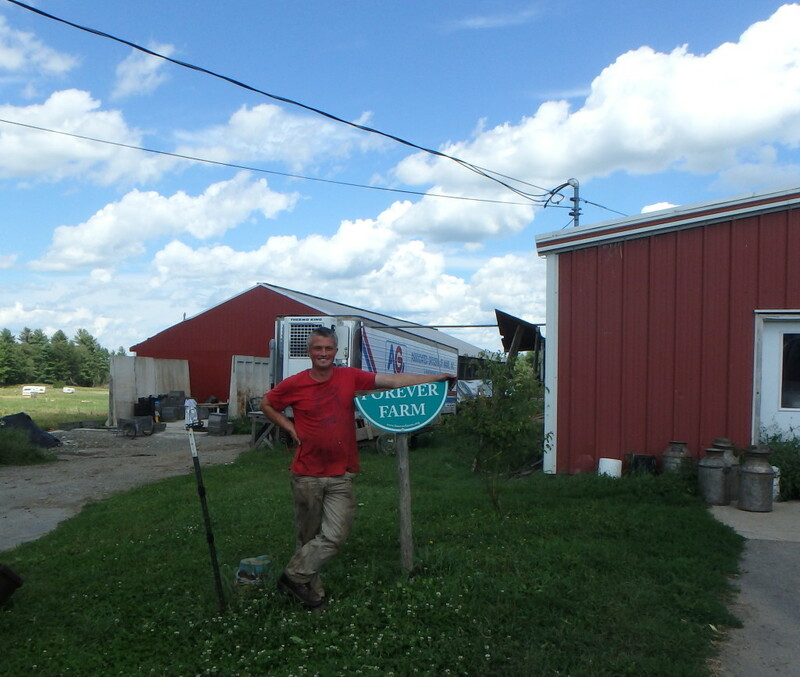 We need financial help to rebuild the vegetable wash shed in time for fall root crop harvest and to meet the deductibles on the barns so that we can keep our animals safe, well fed, and warm this winter. Our cash flow will suffer from the vegetable, crop, and livestock losses, but we have faith in our friends, customers, and the healing of time. This entry was posted in Farm News on August 2, 2015 by katia.